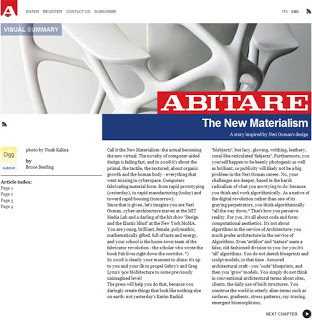 The New Materialism is a profile on MATERIALECOLOGY published on this month's ABITARE magazine (the May issue). Read the full online story here (link below). The essay was written by the brilliant Bruce Sterling who is considered one the founders of the cyberpunk literary movement. Sterling is interested in exploring the relationship between life and technology and runs a seminal blog for Wired magazine. In 2005 he became the first “visionary in residence” at Art Center College of Design in Pasadena, California. Thank you, Bruce, for an uplifting and, indeed, an epic account of hack culture. I swear not to die by it. Make sure to check in seven (good) years.